John Shannon, (better known as ‘Jack’) was born in Cloneven, County Wexford, Ireland in 1893/1894, later moving to Jacksdale with his sister, Sarah Shannon. In 1911 John, who was employed as a labourer at the pipeyard, was lodging at the home of Henry & Mary Hill, at York Avenue, Jacksdale which comprised of 5 rooms in all. Living conditions must have been cramped as the Hills had 7 children still at home, plus one other lodger as well as John. John did not marry but his sister, Sarah, became the wife of Arthur Graney who was also killed in WW1. 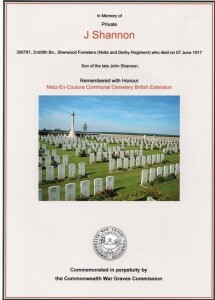 A ‘Free Press’ newspaper obituary dated August 1917 states: “John Henry Shannon, Sherwood Foresters, aged 23. Enlisted on February 5th 1916 and went to France in February 1917. He was missing on the night of June 9th (1917) and his body was found a few days later and buried in the cemetery at Metz. Jack, as he is better known, attended St Mary’s Church. He was the brother of Mrs A Graney whose husband is also a soldier.” (Arthur Graney 10th Bn, Sherwood Foresters was killed on 10th Sep 1918). The Sherwood Foresters Roll of Honour shows that he enlisted at Eastwood, Notts. and states date of death as Thursday 7th June 1917 indicating that he was killed in action when serving at Havrincourt, France. He was 23 years old at time of death. He was the son of the late John Shannon. We have been informed that the serviceman in the photograph below is John Henry Shannon – better known as ‘Jack’ Shannon. 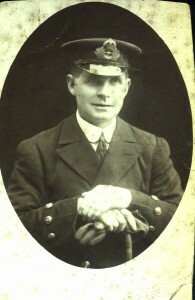 However as the John Henry Shannon listed on the Jacksdale War Memorial was a Private in the Sherwood Foresters, we believe that the gentleman in Naval Uniform, shown in the photograph could possibly be ‘the late’ John Shannon, father of John Henry Shannon, or perhaps another relative. We would very much appreciate any information which would help us unravel this mystery.